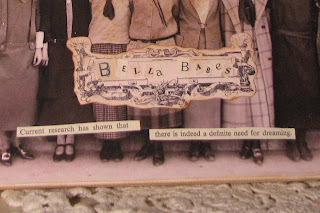 This is one of the inspired artwork pieces from Teresa McFayden's Bellarama. Once I saw Teresa's artwork and the story behind it, I just had to make one for myself. 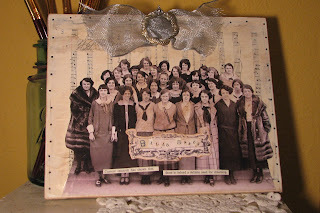 I put together this canvas with vintage sheet music and ledger papers that I received from my Junkin' Journal swap papers from Silver Bella. I then added a silver ribbon and round broach that I topped with a crown tie tack that had been my Granddad Jones. 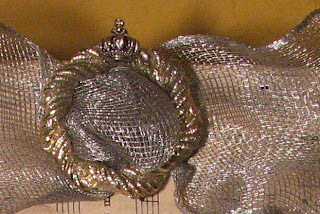 I couldn't believe my eyes as I was trying to find some vintage pieces to embellish and just happen to spot this one. I then dug around in more of my Junkin' Journal swap papers and found a perfect quote from Ann Landers on dreaming. "Current research has shown that there is indeed a definite need for dreaming." I love it! Dreaming seems to be the theme for the day in the blog world. I'm embarking on a long time dream and my friend Maisy at www.themaisyreport.blogspot.com wrote about figuring out what your dreams are. What a beautiful reminder of such a fun time! This collage is awesome girl!